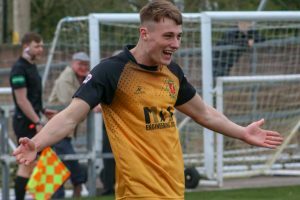 Annan Athletic equalled their biggest victory since joining the SPFL with a 6 nil win over Berwick Rangers, with all six goals coming in a stunning second half performance at Galabank. Annan Athletic strengthened their position for a top 4 finish with an emphatic six goal second half victory over Berwick Rangers at Galabank. Berwick Rangers will look back on this match as a game they could have punished Annan Athletic particularly in a first half where Berwick Rangers had Annan rattled and if Berwick had got their noses in front the match could have turned out differently. Annan however were a different team in the second half and as they upped the pressure on Berwick and when Owen Moxon headed Annan ahead in the 46th minute there was only going to be one winner. The Annan starting eleven showed two changes from the previous week with Ayrton Sonkur and Kyle Bradley brought in. Annan started the match promisingly with Nade’s early header being tipped over the bar by Sean Brennan. From the resulting corner Nade’s header was once again saved by Brennan. Annan continued to pressurise the Berwick defence and Nade set up Aidan Smith who’s shot was directed straight at Brennan. Berwick then took control of the proceedings, Grant Rose went close when his header went narrowly past the post, the same player then tested Alex Mitchell who pulled off an important save to deny Rose. Minutes later Swinglehurst appeared to be at the wrong end of a booking as he was pulled back when defending a Berwick attack. Annan were being tested to the limit and in the 31st minute Cameron Blues was denied by another important save by Mitchell as the Berwick player one on one with the Annan keeper once again saving his team with a fine save. Chris Johnston then tested Brennan with a net bound shot and the keeper pulled off a fine save to push the effort for a corner kick. From the resulting corner Moxon’s miss kick went wide of the target. The second half rout started almost immediately after the whistle was blown when Nade flicked on Johnston’s cross onto the head of Moxon who headed into the net form six yards. Annan doubled their lead from the penalty spot in the 51st minute after Moxon was fouled and Wallace converted from the penalty spot. Two minutes later the goals continued to come when Scott Hooper set up Chris Johnston who slotted home from 4 yards. Annan’s sixth and final goal in the 77th minute was scored by substitute David Wilson who scored from close range to complete the misery for the Borderers. Annan – Alex Mitchell, Scott Hooper, James Creaney ( Lewis Strapp 66 min ), Kyle Bradley, Ayron Sonkur, Steven Swinglehurst, Tony Wallace, Owen Moxon, ( David Wilson 66 min ), Aidan Smith ,Christain Nade ( Tommy Muir 66 Min ), Chris Johnstone. Subs not used Aidan McAdams GK , Jack Brannan, Peter Murphy. Berwick Rangers –Sean Brennan ,Andy Forbes, Declan O’Kane, Robert Wilson, Craig Hume, Jack Cook, Craig Hume, Lewis Barr ( Calum Adamson 70 min ), Douglas Brydon, Grant Rose, Jack Ogilvie, Cameron Blues ( Daryl Healy 70 min ), . Subs not used Ryan Goodfellow GK, Ahmed Aloulou, Sean Murphy, Aidan Mcilduff, Ross Brown. The top of the table clash between Clyde and Peterhead saw Clyde come back from 3 – 1 down to grab a point in a 3-3 draw. Edinburgh City lost ground at the top after they suffered a humiliating 4-1 defeat at the hands of Cowdebeath. Albion Rovers are still in the in the relegation zone after they were defeated by 4 goals to nil against near rivals Queens Park. Stirling Albion scored a late winner to defeat Elgin City 2-1 and now remain the only team who can now deprive Annan of the final play off place.